Current Tenant: Blacktooth Brewing Co. Built in 1947, this building was occupied by the Sanderson Motor Co until the 1950s. Poll Motor moved in to this location in the 1960s, and the original signs for Poll Motor can still be found on the building today. 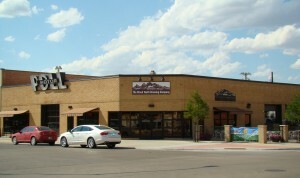 In 2010, the Blacktooth Brewery converted this space into a brewery, including full brewing equipment and a banquet room. This brewery is quite a popular location for local residents and tourists alike.